Father Patrick Peyton, C.S.C., believed a simple truth: the family that prays together stays together. is an inspiring documentary about a poor, uneducated Irish immigrant who sets sail for America in 1928 with nothing but his faith and dreams of becoming a millionaire. Arriving in Pennsylvania, he is unable to find work so he accepts a position as a janitor at the cathedral, rekindling his long lost desire to become a priest and changing the course of his life. Nearing ordination, his life takes a radical turn when he is struck with tuberculosis. Facing certain death he sinks into despair. A visit from his mentor who delivers a simple message to pray lifts the darkness. Taking his advice to heart, Patrick prays fervently to Mary, the Mother of Christ, for her intercession. He experiences a miraculous recovery and, deeply indebted to God for his recovery, dedicates his life to tell all the world about the power of prayer and encourages families everywhere to bring prayer into their homes. Never taking no for an answer, he convinces Hollywood's biggest stars to help him spread the message that “the family that prays together stays together" through the power of mass media, including radio, television and film. Father Peyton's fame spreads around the world and audiences in the millions flock to his public prayer rallies. 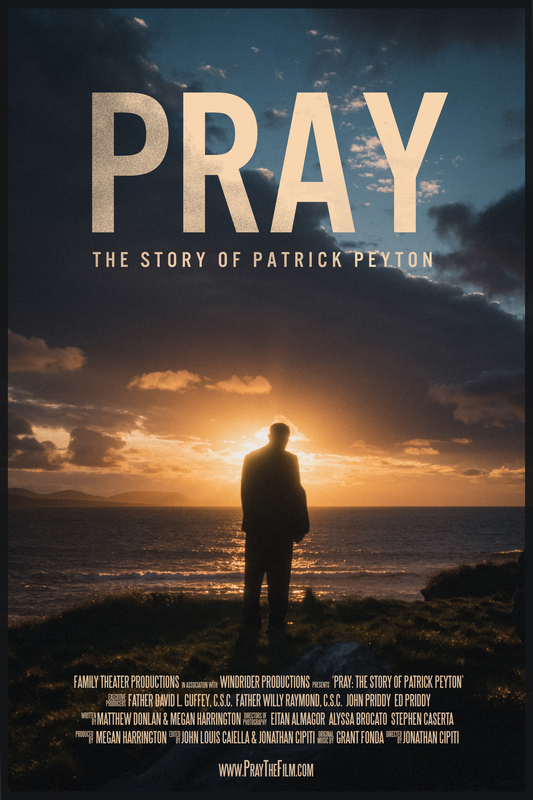 This is the true story of a tireless fighter, an unlikely hero and one of history's greatest champions for prayer. Watch for film release in early 2020! "If families give Our Lady fifteen minutes a day by reciting the Rosary, I assure them that their homes will become, by God's grace, peaceful places."